Writ­ten some­time before August 7, 2009 8:31:46 PM MDT Seen some­time before 5:17pm August 7, 2009 Jack­son Hole, Wyoming. Soon we start see­ing some­thing we hadn’t seen in all our time we spent in Yel­low­stone: Wildlife.2 We see chip­munks, mar­mots and oth­er rodents scram­bling and birds tak­ing flight. I point out the wildlife to Mac as we keep speed-walk­ing down the road, pass­ing some bath­room facil­i­ties and trash­cans that appear to have long been in dis­use, but have bright­ly coloured pic­tographs indi­cat­ing that food should be secure­ly thrown away so as to not feed the wildlife. The pic­to­graph that gets the most atten­tion is of a bear track in alarm­ing­ly bright yel­low and it occurs to me that we are tramp­ing down a road­way that isn’t being used much if any and that we are sup­posed to be in the wilder­ness and sud­den­ly I hal­lu­ci­nate the head­lines: Ore­gon fam­i­ly on way to Ken­tucky gets eat­en by bears by stu­pid­ly going into unpop­u­lat­ed area. But for a few sec­onds I think I can keep­ing going, I can ford the boul­ders while car­ry­ing Mac and get to The Spot and get The Shot, but of course I can’t. I can­not go on. I have to think about Mac and the fact that this feels exact­ly like the kind of sce­nario in movies where the audi­ence is slap­ping their heads in dis­be­lief and scream­ing at the movie to “get out!” So I leave with­out The Shot and by this time have spooked myself quite a bit and rush to grab Mac and we start walk­ing out quick­ly. There is noth­ing creepi­er than look­ing into dense for­est and see­ing noth­ing and Mac sens­es this. I start telling him every­thing is just fine and not to stop or look back and, even­tu­al­ly, I place him on my shoul­ders and we skedad­dle the hell out of there and meet Jenn who is won­der­ing where the hell we’ve been all this time. This gets me think­ing about real­i­ty. 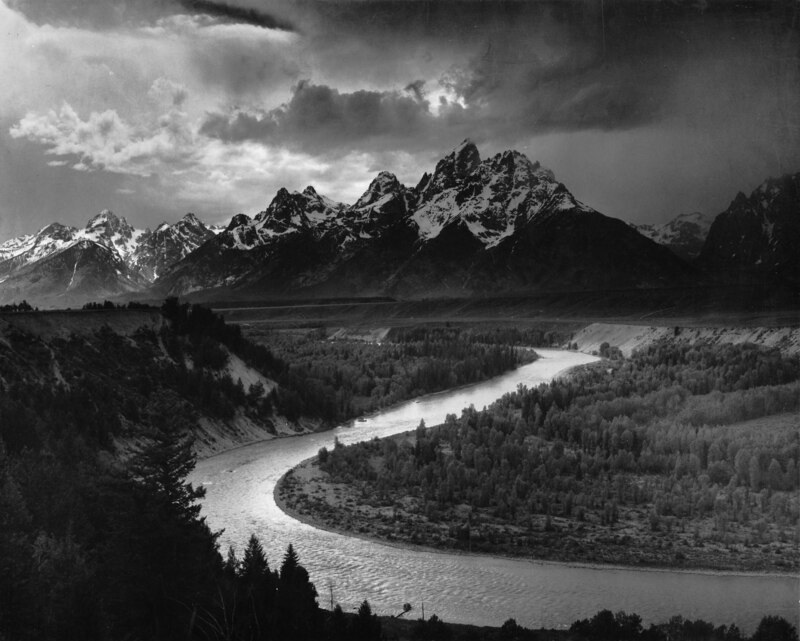 The pho­to by Ansel Adams at times feels more real than see­ing the Tetons in real life where­as when we tried to see the Grand Pris­mat­ic Spring, our view was obscured by all the steam from the hot spring which made see­ing the pho­to of it in the guide book feel like an LSD trip. I won­der if I had found The Spot where Ansel took his pho­to, would I be able to see the Real Thing or just “see” the pho­tos super­im­posed over the real thing, thus obscur­ing the actu­al thing I want­ed to see, i.e the thing I was inspired to see by the pho­to is now irrev­o­ca­bly dis­placed by that pho­to, it now being the thing keep­ing me from see­ing the real live moun­tain in front of me. My head hurts. I’m going to bed. Adden­dum: I have since learned that Adam’s Spot doesn’t exit, if it every did except for the brief move­ment when he trig­gered his camera’s shut­ter. The trees have con­tin­ued to grow and so nei­ther the riv­er or the Tetons can be tru­ly seen, if such a thing is pos­si­ble.